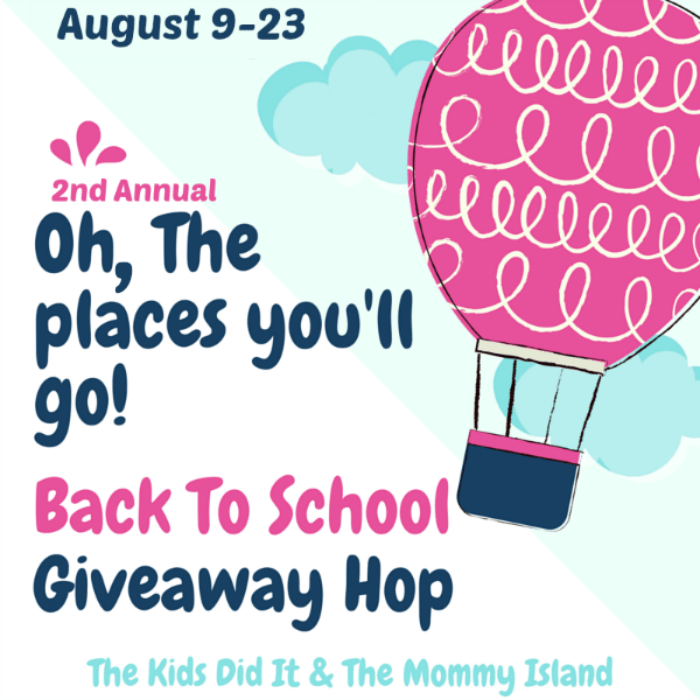 Get a Little Help with Back to School Expenses with the Oh, the Places You’ll Go Giveaway Hop! It’s hard for me to believe the kids are going back to school already! What happened to summer? My heart tells me summer just started, but every store tells me different. The back to school supplies are out everywhere, along with fall decorations! If you look around a little, I’m sure you can find Christmas decorations too. The expense in getting children ready for school seems to grow bigger with each passing year. To provide a little help in that area, my giveaway in the Oh, The places you’ll go, Giveaway Hop, is a Visa gift card worth $50.00. Enter here for a chance to win the Visa gift card and then check out each blog listed below. There are an incredible 95 blogs participating in this giveaway hop organized by The Kids Did It and The Mommy Island! Thank you to both of them! 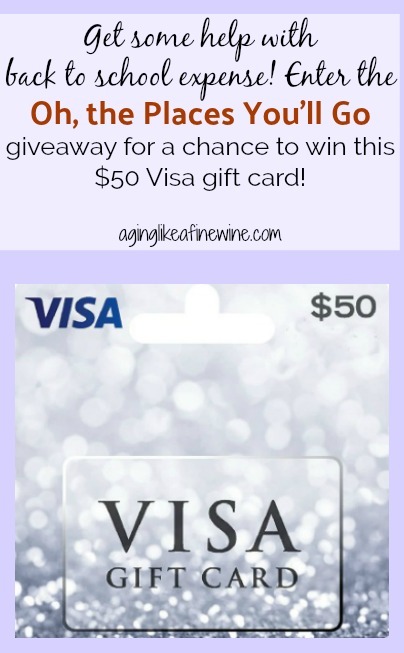 Aging Like a Fine Wine is giving away a $50 Visa gift card to the lucky, randomly chosen winner of this giveaway. Aging Like a Fine Wine received no compensation for this post/giveaway. Now that you’ve entered Aging Like a Fine Wine’s giveaway check out all of these other great giveaways! My daughter can’t wait to start school! That’s good, makes it easier to get them up and ready! My granddaughter is SO excited because she is going to be starting Kindergarten. She just got her new backpack and all of her school supplies! I cannot wait to see her blossom in school. God bless everyone! How exciting for her and for you! I hope she has a wonderful year! If you’re the winner, enjoy the gift card for yourself! My kids are kind of indifferent to the start of the school year. I hope it is a super good year for them! Thank you for entering the giveaway. My kids are excited to go back to school to see their friends! That’s great, makes it easier on Mom! Thank you for entering the giveaway. Yes my son and grandsons are looking forward to going back to school. I’m so glad. They have to go and it makes it much easier if they go willingly! No they are not excited about back to school. I’m sorry! Hopefully their school year will be much better than they anticipate! My niece is very excited to start kindergarten this year! She loves her teacher. I’m always glad to hear that children are put with the right teacher for them. Oh, Barbara, I remember those days! I don’t have school age children and no grand children, but when my son was school age, he was always excited to go back. I’m glad to hear his school experiences were good. May they both have blessed years! Yes, my son is excited. That’s good; I hope he has a wonderful year. My niece is very excited, and I’m sewing her a little pocketbook/tote for school. She is a lucky little girl to have such a great aunt! My daughter going into 3rd grade is really excited buy my son going into 7th grade isn’t to happy. Aw, the challenging middle school age. I hope his year is fantastic! I don’t have any children or grandchildren, but my nieces are excited about going back to school. They love school! That’s great! How old are they? My nephews are not excited to go back to school. I hope it’s better than they anticipate! Yeah, Mom time on the horizon! My own girls are older and no longer in school, but I have a great niece who is starting kindergarten this fall and she’s super excited, as is my sister. Cora is the only grandchild to my sister and her husband (and likely to remain the only one). Therefore, too, my only great-niece, so you know I’m excited! I hope she lives close to you so you can join in the fun. The kids are not excited to go back to school at all. I can understand that; summer seems to get shorter and shorter for our kids. I do not have children/grandchildren. My granddaughter is really excited — she loves school and has the teacher she wanted this year. That’s good, I’m happy for her that she was given the right teacher. It definitely makes a difference. That’s great Uhunoma! What are you studying? Yes, my grandsons are very excited about going back to school! That’s good; makes it easier on Mom and Dad! My children are adults and my grandbaby is starting school this September and is very excited. Im sure she’ll do well because she is very friendly and loving. I hope she has a wonderful year! I remember those days of getting up middle and high schoolers for school. Not an easy task! No my daughter who is in High school is not excited to go back to school. I hope her year turns out to be surprisingly good for her! We homeschool, so I am still deciding on the best time to start back. My daughter is looking forward to the new school year, but keeps asking if we can still go to the pool! haha!! I think public school often starts too soon, don’t you? When my kids were in school it was always the day after labor day. I like that, no one has to wonder when it starts, everyone knows. I think my daughter is exicted. She loves college and where she’s chosen. I know she loves that this year she’ll have her own room so she doesnt’ have to worry about studying in the hallway if her roommate is sleeping! I’m happy for her that she won’t have to do that too! My oldest daughter graduated from college this past May. My youngest daughter is starting her junior year at ole miss and is looking forward to parts of starting back, like friends and fun. But not looking forward to studying. College is tough but worth it. She just needs to keep her eyes on the light at the end of the tunnel! We homeschool year round, but they are excited about many of the different workshops and field trips we are planning this Fall/Winter. How exciting! My grandchildren are homeschooled too. My children are excited to see their friends but not excited about having to get up so early in the morning. I can understand that! I hope they adjust quickly. They are somewhat excited, they love summer vacation. I hope they have a wonderful year. I have two kids in high school this year. They both seem excited to be going back. Thanks. My grandson hasn’t started school yet, but he is so quick to pick up on things I know he will do well when he is ready for school. I’m sure he will. I hope he really enjoys it! Yes, she is excited about going back to school. My son is super excited but so nervous! Its his first time. He starts 4k the first week of September and he will be riding the bus the first time too. I think he’s a pretty good mixture of both lol!! We don’t have anyone going back to school this year. My 12 year old son is excited but he is also nervous because he starts middle school this year. My granddaughter is always excited to return to school until she has to get up earlier than normal, ha. She does not want the summer to end and doesn’t want to meet her teacher before the first day of school. My son is 13 and headed to the 8th grade so not so much. He does like school once it gets going and he spends more time with all of his friends. My 2 Grandkids aren’t very excited about going back to school. My grandson is very excited about the 3rd grade. His younger brother is not excited about Pre-School at all. It seems every year summer get shorter. I always get upset when I see Back-To-School Displays and Halloween items in the stores, because I never want summer to end! My Son is all grown up now and my grand kids are too young yet! I don’t have any children or grandchildren but my niece sure is happy to be starting school. Most of mine are but a couple are just not really into school I guess. This is both my son and daughters first year in school and they’re both very excited about it. I do not have any children or grandchildren starting school. My nephews are super excited. They moved after the school year and are starting a new school in a new area and are looking forward to making new friends. My youngest is starting college in a few weeks. She is extremely excited, and so are we! My daughter is excited because she is starting her first year of middle school. My son is not so excited to be starting fourth grade. My niece is super excited to be going to her first year of school this September. My girls are both ready to go back but they are in high school so I expect it. My granddaughter started 1st grade and she just loves school so far. She thinks she is a big girl now. My granddaughter is excited to start kindergarten. My daughter is not too excited, but she will be once it starts. Our oldest son is looking forward to school. Our youngest son really could care less. My kids are divided about their going back to school excitement. They look forward to seeing their friends but not to the homework. My oldest may be since it’s her senior year. My youngest daughter could go with out school forever. Thank you! My kids are grown now. They always had mixed feelings about starting school. Mine will be homeschooled starting this year so I”m sure they won’t mind “going back”. Thanks for giving. Besos Sarah. My cousin is very excited. my kids are definitely excited to go back to school next week. Thank you for the giveaway. My daughter started her junior year of high school this month. She was semi-excited about returning. I think she is anticipating her senior year! I am a non-traditional college student. I graduated with my Associate’s in Social Work this past May. I am returning on Monday to work on my minor in Medical Office Tech. I plan to transfer and finish my SW degree in the future. Anyway, I’m excited, but I am also extremely nervous about starting my minor! My boys are definitely not excited about the return to school. Think they might picket me if I mention it one more time. My grandson’s are semi-excited about going back to school. They really don’t want summer to be over yet. My daughter is half and half over school. She is excited but also nervous because she is changing schools for the second year in a row. My grandson was a little reluctant to start back to school but he’s doing fine now. I have one son that is not excited to go back to school and the other one is ready to go back!! My nephew was really excited and my niece was nervous, but they are both loving it now! No kids. I look forward to the cooler weather. Some yes and some no. One of my kids is excited to go back and the other is somewhat apprehensive as they will be attending a new school starting junior high. My nephew loves first grade. I don’t have any children or grandchildren. Our grandson is only 9 months old but I remember how excited I always was when it was BTS time! I don’t have any children or grandchildren. We bought school supplies and donated them though. I keep a stash in case anyone needs them. One of my nieces just started kindergarten and she was ecstatic to go to school. Most of the other nieces and nephews were excited, but none were as excited as Lyla. My daughter is super excited about going back to school. She cant wait to see old friends and make some new ones! I have a son who’s going to college in a few weeks. He’s excited and I’m happy for him! Yes, the little ones are excited! My nephew is excited about going to school until about two weeks in, then he is ready for break again. She was excited! Her first day was on Monday and she came home telling stories of her new friends. It was precious! My daughter is hall and half. She wants to stay lazy all day but she’s ready to meet new friends! My grands were very excited about returning to school. So far they are still enjoying it. I have a son in college who is excited about going back because it’s his last year. No kids, but I was always excited for the first week and then the excitement wore off. I don’t have any kids but my nieces were not excited at first, but it’s growing on them. My daughter is excited since she will be the top dog now in fifth grade. My kids are super excited about going back to school! And one is excited about going to school for the first time, although I think she will also be quite nervous when the first day comes. My daughter is very, very excited to go to school. yes, our daughter is excited about going back to school. They’re excited to see their friends. When my son was in school. he was never excited about heading back. He was never a fan of school, lol! My daughter is starting kindergarten this year and she is super excited.I am so sad though! This growing up thing is tough on a mama’s heart! They are excited to see their friends on a daily basis. My niece is excited about going back to school! I’m excited for my little guy to start pre-k! I have a niece who is excited to start preschool in a week. Yes, my youngest daughter is excited about starting back to school next week. Just finished up all of her school shopping today. My daughter is excited for school. My son is not.